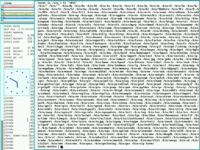 This page maintains a list of academic, personal, and small non-commercial operating systems. For information regarding commercial or mainstream operating systems, please visit Wikipedia. OSes have a high mortality rate: between 2004 and 2006, 112 of 213 OS Projects disappeared from the Internet. And looking at how often these projects are started by using the OS Project Announcement forum, in that same time period 68 projects were announced! The current total is 175 projects, but just 58 of them are active (as of January 1, 2018) and only 62 have been updated at least once since 2018 (three of which have been since abandoned), and 27 since 2019. Please help keep this list current by correcting it if you see any outdated information. OSes without an update since 2015 are now located at Abandoned Projects. Particularly advanced and successful operating systems can also be found at Notable Projects. The Apollo project is a microkernel designed for maximum portability. Closely following the UNIX Philosophy without being unix itself. The Project has been active for about 6 years, with about 8 complete code rewrites along the way. Aqeous is a new Completely-from-scratch, Not-a-UNIX 32 Bit pmode OS (basically a kernel right now), with SMP style Multi-Processor Support each using Multilevel Feedback Queuing Scheduling, Implementing its own FileSystem AqFS (also made a windows side AqFS Driver to communicate), Pretty good Shell, Pretty Neat VESA Graphics drivers, A Composting window GUI system with double buffering and Alpha-Blending, A primitive Scalable Font Rendering Engine and off-course mouse and keyboard drivers , Shell Scripting Support (like .bat in Windows) etc. Many things are in active development and its still not even in alpha. The Code may look pretty stupid but yeah that won't be that bad for long. The goal is to make something on which u can open facebook and send me a 'Hi' :) Currently It supports only Qemu :( But working on that too. AQUA OS is a 32 bit protected mode operation system, that has a nice organic and natural graphical interface. It is also very developer friendly, with loads of APIs. AquilaOS is a UNIX-like operating system, intended to be fully POSIX-compliant. Its design follows a generic and robust approach. Many POSIX interfaces are already supported including multi-threading, and many POSIX compliant applications have been ported. 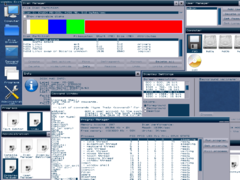 Asuro is an x86 Operating System that started development in 2015 as somewhat of an academic project. Written almost entirely in Freepascal, with NASM used only for bootstrapping & minimal low-level routines, Asuro is a purely hobbyist operating system that differs quite majorly in design from any mainstream OS by using a VM/SE to run anything other than kernel code. Aura is part of a larger idea, Project Asiago. It's goal is to reinvent all the currently outdated systems in one unified setup. Aura is just the kernel part of this. awooOS is an experimental, monotasking operating system, bringing together old ideas and new technology. It is designed around a microkernel, with as much moved into libraries as possible. The kernel proper is less than 50 lines of code. BCOS is a practical distributed operating system, initially aimed at 80x86/PC compatible computers. In general BCOS is meant to (eventually) make a group of computers connected by a network (a cluster of computers) behave like a single computer with multiple users. Beelzebub (The Lord of Flies) features a hybrid kernel, accompanied by libraries and apps written mainly in C++, serving as a platform for development and experimentation of kernel/OS/runtime features. It currently targets AMD64, with plans to support IA-32 and ARM architectures later. It aims to become a clean, modern, and efficient operating system for servers and workstations. 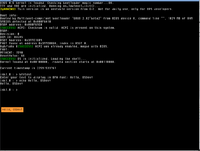 A simple "Unix-like" x86 kernel trying to be POSIX compliant. Currently, the project does not have any long term mighty ambition, it just want to be a good learning tool for operating systems and low level programming topics. A future "on-the-field" usage, especially when ARM port will be ready, is not excluded. The BlueKernel is a simple microkernel design intended for students. It has pre-emptive multitasking with threads, message-passing and virtual memory. It is currently targeted for the IA-32 processors, but the design is strictly separated into a hardware-dependent mechanisms layer, with an independent policy layer on top of that. It has its own basic boot loader that loads the kernel and a disk driver. It also has a basic text-mode display driver and keyboard driver. As with most microkernels, the drivers run in user space and help to demonstrate message passing and interrupts. When the system starts it loads a server that allows the user to load their own processes. There are very simple example user programs to demonstrate threads, message-passing and interrupts. The website is written like a textbook to explain how it all works, focusing on the implementation rather than theory. Modular multi-platform OS. Even Kernel C library dynamically linked (using very basic duplicates). Written in Visual C++ and NASM. Simple multitasking (no SMP at now) x86-64 kernel and software written in assembly language (already archived: window manager, TCP/IP (1 connection at a time), Ext2). Started as a hobby since 1 January 2013. Dennix is a unix-like operating system for x86 written in C and C++. It consists of a monolithic kernel, a standard C library and userspace applications. A learn-by-doing OS with a basic GUI. Home-made operating system, developed in C and asm for x86 architectures. Escape is a 32-Bit microkernel operating system for X86 that supports multitasking and multithreading. It's implemented in ANSI C, C++ and a bit assembler and most parts of it are UNIX-like. The goal is to experiment with it and learn as much as possible about operating systems, hardware and so on. Fiwix is an operating system kernel written from scratch, based on the UNIX architecture and fully focused on being POSIX compatible. Fudge started as a project to see if it would be possible to create an operating system that came as close as possible to be fully deterministic by not implementing solutions with unpredictable behaviour like dynamic memory allocation, scheduling and caching. Fully featured open source operating system inspired by the commercial Be Operating System. Has a preemptive, modular kernel, nearly complete POSIX compatibility, a nice (non-X11-based) GUI, and a wide variety of ported and native applications (including a WebKit based browser). Nearly the entire operating system is written in C++98 (including the kernel), albeit with little usage of exceptions. HeliX is a german open-source OS. It has a nice shell and already supports FAT12, multitasking, keyboards and mice and very, very much more... HeliX is still in development and it doesn't exist a long time , so there are many features to come! [at] this point of time there are no downloads at the webpage, because there are still some heavy bugs (; -please be patient; they'll come! Hoho is an x86 open-source OS supporting multitasking with ELF executables, virtual memory, FAT and virtual filesystem, ATA drives and Floppy disks. Soon it will be self hosted with GCC working on top of it. Kolibri OS was a fork of the 32-bit version of Menuet OS but has changed much along the way. Despite fitting on a standard 1.44 MB floppy, this wonderful OS contains: the complete GUI desktop, a lot of drivers and great software (such as web browser and music player), system programs and games! The Kernel and most applications, libraries and drivers are written in FASM, but some are in C-- (https://en.wikipedia.org/wiki/C-- ; link to their C-- compiler: http://c--sphinx.narod.ru/). At this OS you can write the ASM code and execute it after assembling. Source code is open - http://websvn.kolibrios.org/listing.php?repname=Kolibri+OS - and the contributions are welcome! Kora is an operating system under it's way. The OS is still a young pup develop by an enthusiast engineer as a learning project. KOS is a Hobby Operating System. It is meant to be minimalist and easy to understand. MajickOS is a graphical/command-line OS for 32/64-bit computers. It is currently under development, but it's specifications are available on GitHub. Mettā aims to be your mithril compass, that is, a device powerful in determining what is worth and what is not worth doing, in determining when it is the right time for doing so and also on doing the things it can do, without taking up your time. Small and simple operating system. There are 8086 real-mode (Nano16) and 386 protected-mode (Nano32) versions. The Night kernel is a 32-bit drop-in replacement for the original 16-bit kernel of the FreeDOS operating system. It uses linear memory addressing and operates in protected mode on the Intel x86 architecture. The typical user will retain compatibility with their DOS applications and gain protected mode abilities such as task switching between applications, protected memory and increased overall performance in a DOS environment. Nutoak is an x86 operating system. Check website for more info. Operation Replicant is an operating system for a revolutionary gaming console that is in development. Latest update: 2018-09-10, is in preliminary development. OS/Z is an open-source, multiplatform, micro-kernel hobby OS written in C and assembly. It implements some interesting, non-standard concepts, and it's deliberately not fully POSIX compliant (although the API is POSIXish as much as possible). Its goal is to handle big amounts of data (in magnitude of yotta) in an user friendly, efficient way. Has it's own built-in debugger, memory allocator, unique VFS implementation and graphical interface protocol which is somewhere between X and Wayland. Currently supports x86_64 and AArch64 architectures and is under heavy development. A small public-domain OS, based on the 'nanos' nanokernel. Quark is an Object Oriented 32 bit operating system. It aims to be a complete multitasking kernel. Quinn OS is a 32-bit x86 compatible protected mode hobby operating system with multitasking. There is a graphical user interface, FAT file system driver and basic TCP/IP stack. A KISS Unix-like operating system, written in C and Assembly for x86_64. 32-bit microkernel designed for code readability. colorForth computing environment for x86 PCs. Written mostly in C, to be ported at least to PowerPC Macs and x86-64 PCs. Silcos is a operating system that aims to provide a secure & robust environment for applications. It will sandbox all external executable files and also have advanced security in matter of object-management. It is in the development phase with the kernel being developed. The silcos kernel works in a modules which are dynamically loaded at runtime and divides itself into various modules like KernelHost, ModuleFramework, ObjectManager, and ExecutionManager, etc. It requires open-source support and will appreciate any! It is currently being developed in C++ and has a very object-oriented approach. Full documentation is provided in the code itself. Other than that, good GitHub wikis document it very well. Sortix is a small self-hosting operating-system aiming to be a clean and modern POSIX implementation. It is a hobbyist operating system written from scratch with its own base system, including kernel and standard library, as well as ports of third party software. It has a straightforward installer and can be developed under itself. Releases come with the source code in /src, ready for tinkering. A completely-from-scratch hobby operating system: bootloader, kernel, drivers, C library, and userspace including a composited graphical UI, dynamic linker, syntax-highlighting text editor, network stack, etc. A research-purpose Operating System that discovers features on Intel x86 processors which is inspired by Linux. Welcome to contribute! 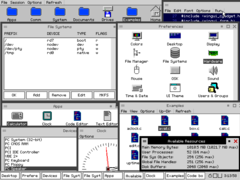 Tupai is a monolithic unix-inspired operating system kernel that runs on i386-compatible machines. U365 is a monolithic 32-bit OS in its alpha stage. It includes VFS, STDIO, keyboard and mouse drivers, VESA modes and some simple screen surface management. We used C and Assembly to code it. XEOS is an experimental 32/64 bits Operating System for x86 platforms, written from scratch in Assembly and C. It includes a C99 Standard Library, and aims at POSIX/SUS2 compatibility. 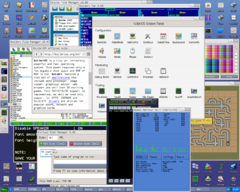 xOS is a hobbyist operating system project written mostly from scratch for the PC, entirely in FASM-style assembly. The principal goal of xOS is to be compact and lightweight, yet be suitable for use in the 21st century, in terms of speed, features and hardware support. As such, xOS supports IDE and SATA hard disks, partial support for USB, networking, a rudimentary web browser, and a compositing graphical user interface. The kernel and drivers have been written entirely in assembly, while applications can be written in C.
XtOS is an operating system with a kernel written in C and a userspace written in C source code which is interpreted on runtime. 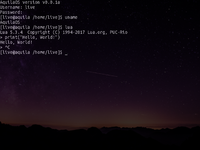 The C interpreter is based on TinyC and implemented inside the kernel along with the window manager. Everything runs in Ring 0 and C applications are able to access most of the functions that the kernel is able to. YaxOS is a very primitive OS running in real mode. 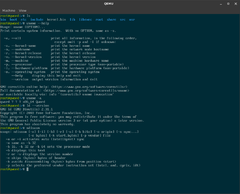 Written in C from scratch, ZeldaOS is an UNIX-like kernel which is aiming for POSX.1 compliance and running on any x86 and x86_64 processors. Also, the kernel is designed to support more and more networking features. This page was last modified on 5 April 2019, at 17:22. This page has been accessed 905,152 times.